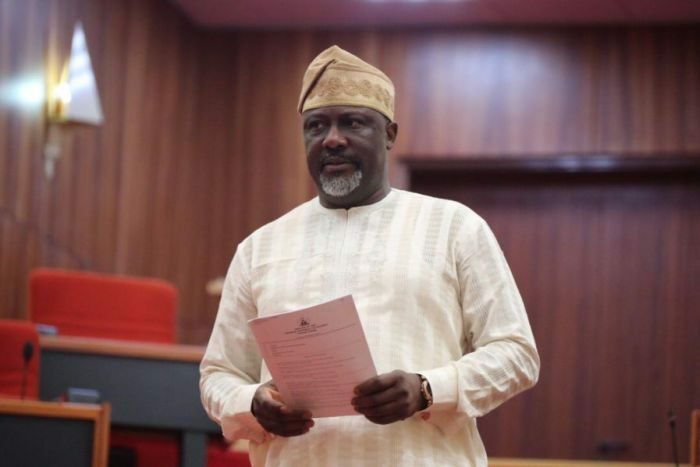 The lawmaker representing the Kogi West Senatorial District, Senator Dino Melaye, has petitioned President Muhammadu Buhari alleging that the Nigeria Police are threatening his life. Melaye, in the petition dated October 13, 2018, and addressed to the President, chronicled his battles with the men of the Nigeria Police both in Abuja and Kogi. The Chief Justice of Nigeria, Amnesty International, European Union, United States Embassy, British High Commission, United Nations, Canadian Embassy, German Embassy, Economic Community of West African States and the African Union were copied. The senator also accused Governor Yahaya Bello of Kogi State of being behind a plot to kill him. He urged Buhari to order the Inspector-General of Police, Ibrahim Idris, to restore his police details withdrawn since April, in order to guarantee his security especially as electioneering had begun ahead of the 2019 general elections. “Your Excellency Sir, may I, therefore, most humbly and respectfully urge you to caution the Nigeria Police. It is very clear, given the chronology of events as encapsulated in this petition, that the Kogi State Governor is using the Nigeria police, in his bid to stop my political ascendancy, to assassinate my person. “I have made several reports to local and international organisations, to alert them to the looming plot to kill me, by Governor Yahaya Bello, using the Nigeria Police Force, especially the Commissioner of Police, Kogi State. I firmly believe that the security of lives and property of every Nigerian citizen should be of paramount concern to the government.